two of the four U-Loop reactors visible during the Protelux construction process. 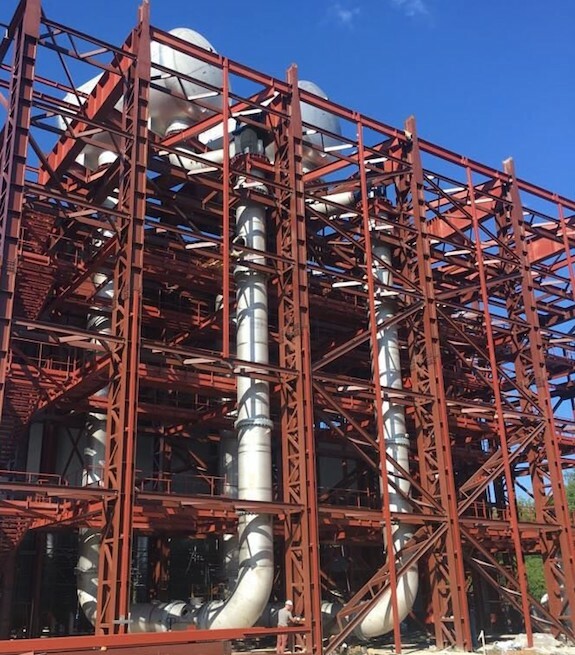 Notice the size of the worker in the bottom of the picture.In Russia, Protelux completed the construction of its 6000 ton per year methane-to-proteins plant, based on Unibio technology. The parties are currently testing the plant and expect to commission it by late 2018. It’s a solid step for Unibio, a giant leap for single cell protein technology globally — and not the least in Russia. The demand for the product has never been in question, nor the abundance of methane feedstock. The question has been the absence of a reliable, advanced technology to get the job done. We reported the big backstory here, in “Did little algae freedom fighters win the Cold War?” looking at Soviet efforts to develop and deploy such a technology going back to the 1970s. • The production process always results in a uniform product, and the only waste product is water and CO2. In May 2016 Unibio signed a license agreement with with the intent to upscale and commercialize the Unibio U-loop technology in Russia allowing the conversion of methane into protein. Russia was chosen as an ideal site for such product as bacterial protein is historically known in the Russian market, as Russia has a well-developed compound feed industry, and there is access to an abundance of cheap natural gas. Now, a little more than two years after dry ink on the contract, the first plant is ready for testing and commissioning. We reported in November 2016 that Unibio opened its Denmark-based fermentation plant to convert natural gas into a highly concentrated, single-cell protein and produce up to 80 tonnes per year. The protein-rich biomass is naturally developed without genetic manipulation; can be used as a direct supplement in animal feed; and has already been tested as feed for salmon, calves, pigs and chickens with positive results in terms of acceptance and growth rates. All plant output was sold to Vestjyllands Andel, a Danish animal feed manufacturer, as part of an offtake agreement signed earlier in the year. 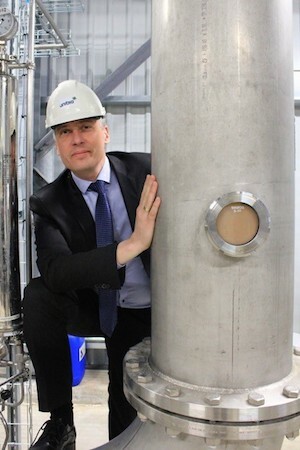 “This technology upgrade makes producing UniProtein much more efficient in terms of productivity and energy usage but also helps us maintain a significant lead over legacy technologies,” Unibio CEO Henrik Busch-Larsen said at the time. According to Unibio, the protein is a sustainable alternative to animal feed and is comparable to LT fishmeal. Adding it to the animal’s diet reduces the amount of feed necessary and minimizing nitrogen excretion. The protein has been tested for salmon, calves, pigs, and chickens and is approved by the European Union. “We see this not just as a perspective investment into cutting-edge technology but as part of a bigger picture: a highly profitable industry of the local agricultural sector built from the ground up. The low cost of natural gas and electricity creates competitive advantages for Russia, when it comes to the production of bio protein*, we can expect this project’s EBITDA to be in the tens of percent. Our strategic goal is to secure its own source of locally sourced protein concentrate which is currently in very limited supply, for the Russian market,” said Protelux’ oversight board chairman Mikhail Serdtsev. KnipBio closes Series B round for its Single Cell Protein: what’s SCP and why is it becoming the hottest development target around?